In a similar fashion to Are the Dinosaurs Dead, Dad? this picture book follows a well-meaning but slightly clueless and definitely unobservant father on a father-son outing. The boy is eager to spot a moose once they sail to a Maine island. His father pooh-poohs the idea and reminds his son to watch carefully for other interesting animals. To the boy's great delight, a curious moose keeps crossing their paths. The father fails to see him until they are heading back across the bay. Young readers will enjoy catching a glimpse of the moose's antlers throughout the book's pages. This one would be a great read aloud title, enabling young readers to pay attention both to text and illustrations. This is a book of possibilities. Not everything that happen is expected, and certainly isn't about to, if the (stupid) father doesn't get his nose out of his book once in a while. Not liking how preoccupied the father is here, barely noticing or interacting with his child at all. He certainly isn't paying attention to what the child is trying to say. Sadly, this has become a standard of modern parenting, seen far too often. That just make me sad, and so the book loses the wonder that it's trying to develop. Fun, rhyming picture book with a hide and seek component that will delight young readers. I also learned some interesting facts about moose, which was a bonus. Jake and his father go on a trip to an island. Jake really hopes to see a moose. His dad assures him that there are no moose on this island. But Jake keeps telling his dad there are. Readers will love seeing how the moose appears and how Jake's dad repeatedly misses seeing him. I like that this explores the idea that when something is unlikely, it doesn't mean it is impossible and we should always keep our ideas open for the magnficent creatures and sights around us. I received this book in the mail today from Goodread's "first-reads" program. The simple, charming story and beautifully bright and playful illustrations are fantastic to look at even as an adult and are sure to delight any child. I can't wait to share this book with my nephew and any other kids who happen to be around. The idea is cute and kind of fun, but I'm not a big fan of the illustrations, and I really hate the font used. It's probably dumb, Those things just got in the way too much for me to actually enjoy the story. Kids might be a lot less picky though. I MAINE I was hoping to see Moose..and didn't see ONE. 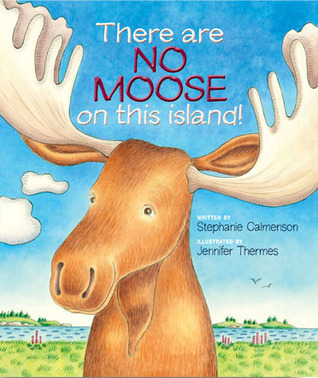 But this is a fun book about a moose...a fun look and find book. Can you spot the moose in each picture?? I enjoyed it! Lots of fun! I thought this was a good book! It shows a good relationship between a dad and a son. They try to look for moose on the island but somehow they can't find one! Why could the dad not see the moose? The boy sees it everywhere. Despite this, I like the introduction to the island habitat that this book offers, and the fun moose facts at the end. Adorable kids book about paying attention and being aware of your surrounding.